It turns out to be fairly easy to accidentally delete the desktop Recycle Bin in Vista. Getting the Recycle Bin back is easy, just not obvious. I meant to hit "Empty Recycle Bin" but clicked on "Delete" instead. Now my Recycle Bin has disappeared from my desktop. How do I get it back? I'm running Windows Vista. To me this seems like a step backwards for Vista. On Windows XP, there is no "Delete" item when you right click on your desktop Recycle Bin. On Vista there is. Not only is that potentially confusing, but even when you do understand the difference, you know what's going to happen. 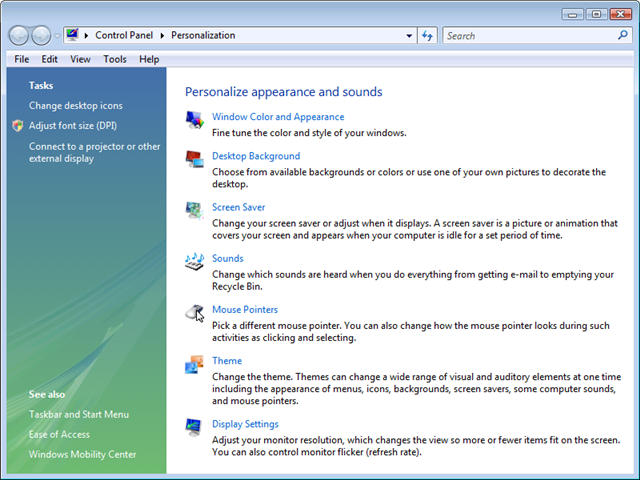 I've highlighted the menu items of interest here: Empty Recycle Bin, which permanently deletes the contents of the Recycle Bin, and Delete, the standard context menu item that deletes the Recycle Bin icon itself. "...I frequently mutter to myself 'yeah, yeah, whatever' and press enter or click Yes without paying attention." The problem of course is that we're so used to these popup confirmations that we often fail to notice or read them. I know I frequently mutter to myself "yeah, yeah, whatever" and press enter or click Yes without paying attention. Whoops. The Recycle Bin disappeared. But as you can see, the message gives the clue we need. 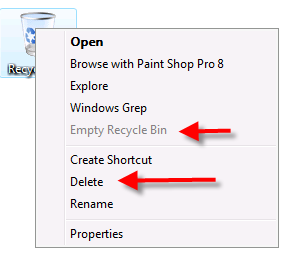 Click the Recycle Bin checkbox as I've highlighted above, click OK, and your Recycle Bin should reappear on the desktop. At least that part is easier than Windows XP. I did the exact same thing. When I tried to put it back on the desktop by dragging it from the Explorer, it does not appear correctly. It appears full when it is not and empty when it is not. This is the correct solution. Thank again, Leo, again you are right on time! In response to the question about the recycle bin not showing full- that is an Icon problem. Go to Desktop Icons screen (see article) and click on Full Reycle bin from picture and then Change Icon and pick the correct one. You can even download Icons and change it to a theme one. Leo, no - the questions about the Recycle Bin not toggling between the icons that show full/empty dynamically are not answered by "selecting the right icon" in the Personalization menu. Once the Recycle Bin icon has been deleted, it seems to lose the logic that allows it to update dynamically (without refreshing the desktop) in response to having contents placed in an empty Bin or having contents deleted from the Bin. We need not just to restore the icon, but to restore the original behavior associated with it. Any ideas how? I'm closing comments on this article, since the VAST majority of the comments are simply "Thank you".